Visitors spent almost $6,000 for every man, woman, and child living in St. Johns County (based on 2008 statistics). You don’t have to own a tourism business or even be employed directly in the county’s tourism industry to benefit from the money our visitors spend while they are here. Over $42 million in sales tax revenue was generated by visitor’s purchases in 2008. 12,000 jobs in the tourism industry were created for county residents by virtue of them being here. Another 27,000 jobs in the northeast Florida region are supported by our visitor expenditures. Have you been to the beach lately? Our visitors pay for beach cleanup, dune walkovers, beachside parks, piers, boat ramps and beach renourishment projects in St. Johns County. Been to a concert at the Amphitheatre? A festival in your neighborhood? A historic reenactment? How about a performance by one of our local professional theatre groups, the community opera, orchestra, or community chorus? Our visitors, through payment of the “bed tax,” financially supported all of these programs and a lot more. All of the County’s tourist development programs are paid for by tourist. Visitors, not residents, even pay for the county’s advertising and promotional efforts to entice them to come back again. Soon. Last year, visitors spent almost $712 million in St. Johns County. 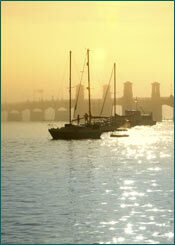 Tourism is St. Johns County’s economic engine.